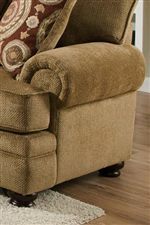 Update your living room with perfect casual comfort by adding this 8645 living room collection to the decor. The collection features loose back as well as seat cushions for maximum comfort. In addition, the rolled arms, bun feet and accent pillows provide the perfect detailing. With an easy sense of style, this attractive collection will make a welcomed addition to your home decor. Browse other items in the 8645 collection from Miskelly Furniture in the Jackson, Pearl, Madison, Ridgeland, Flowood Mississippi area.